We’ve had our dining room furniture as long as we’ve been married. That’s a long time…like 23 years. Oh, the stories that table can tell. We don’t use our dining room very often so it never made sense to spend money on new furniture. 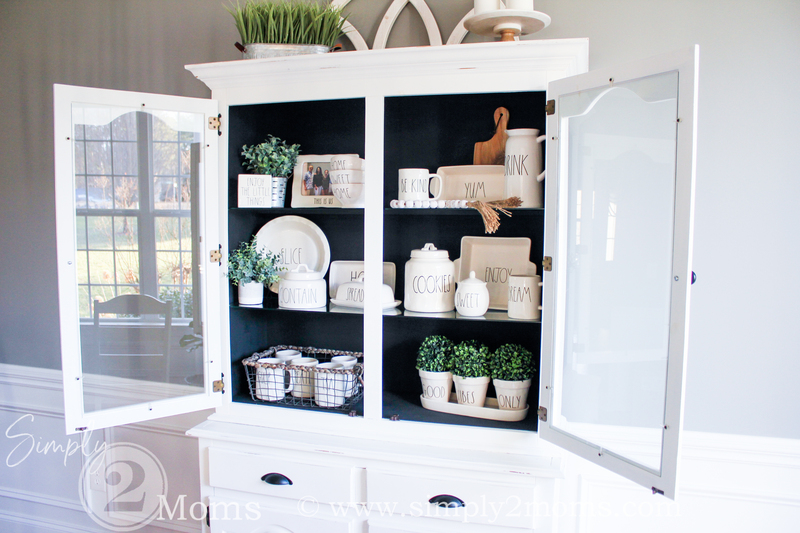 Several years ago I updated the table, chairs & china cabinet with paint. Remind me to show you the transformation someday. Gotta love the power of paint! Our dining room china cabinet displayed keepsakes from our wedding day, my mom’s china, and some treasured pieces from when our children were babies. 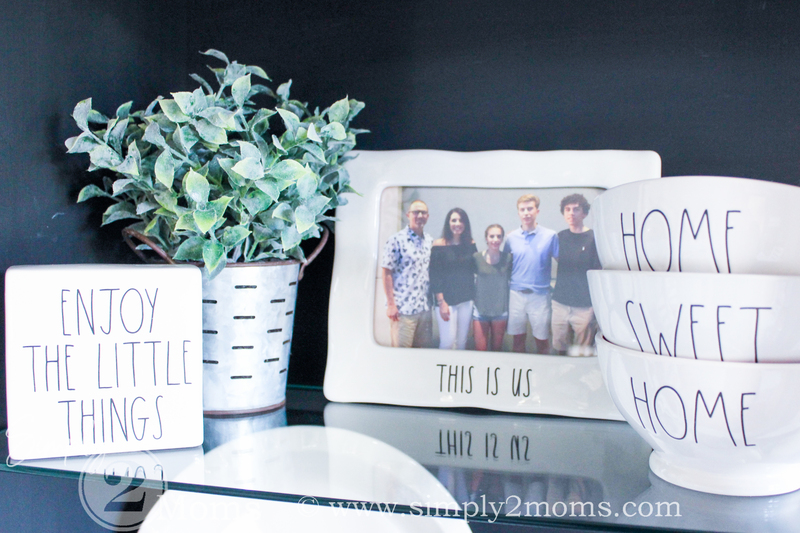 I loved all these special things that held so many memories but wanted something different…something that would go with the style in the rest of our home. 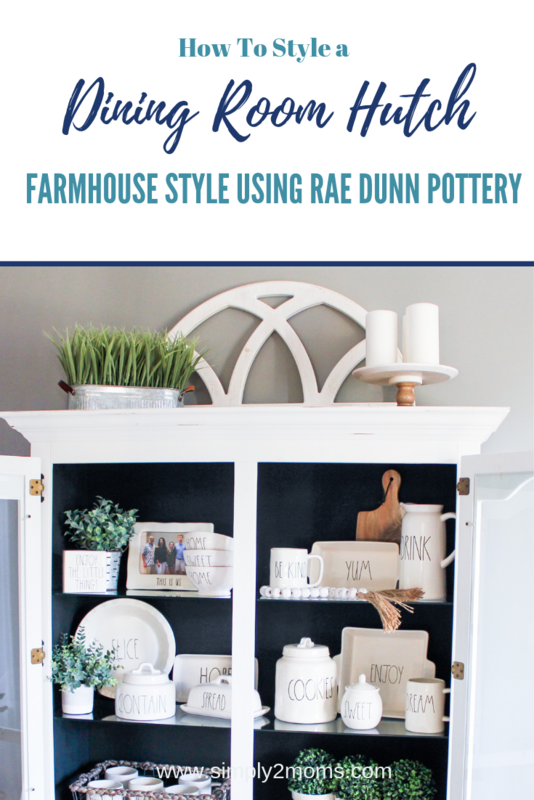 If you’ve been around a while you may know how much I love Rae Dunn pottery. I started collecting last spring when my sister asked me to look for pieces for her collection. 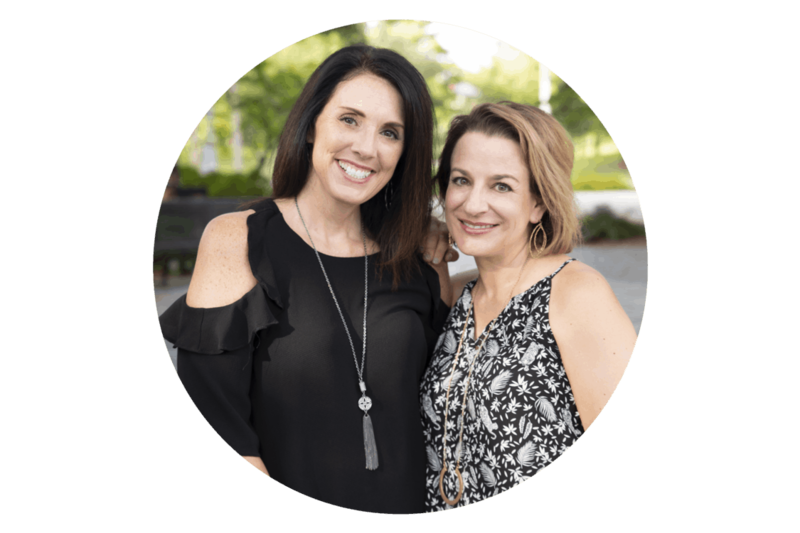 As I searched for her while shopping at my favorite store…HomeGoods, I had so much fun that I started looking for myself too. 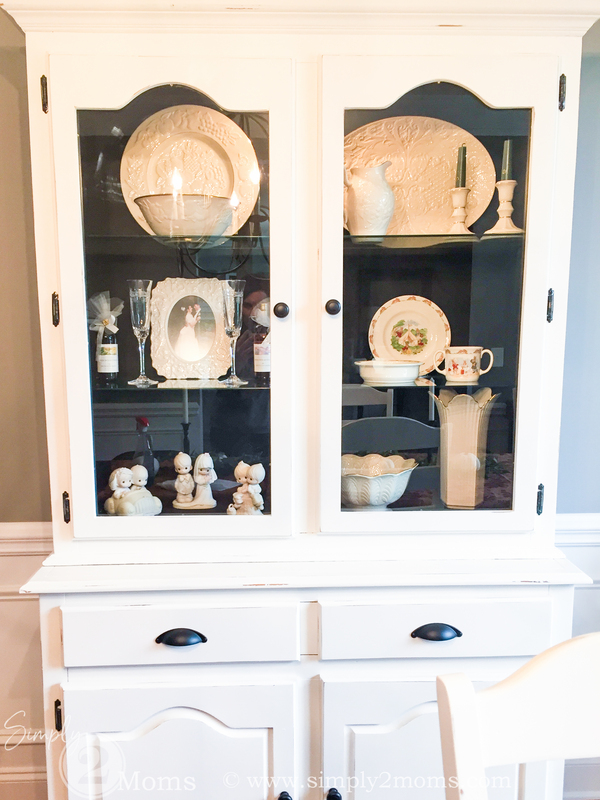 After buying a few pieces of the pottery, I realized they would be perfect to style our dining room china cabinet. And so the hunt began! As I continue to collect Rae Dunn I may swap out some of the pieces I bought when I first started collecting. In the beginning, I would just grab any large letter pottery I found. It was the thrill of finding it…and believe me, it’s hard to come by around here. But now that I’m liking how the hutch looks I am getting more selective in what I buy. 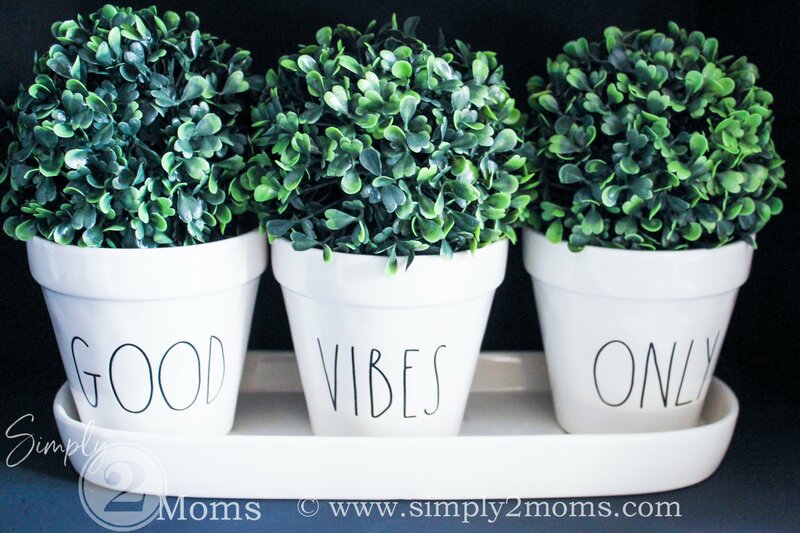 The first Rae Dunn pottery I bought was the “good vibes only” planter trio. I planted herbs in it and sat it on our kitchen window sill. It looked so cute…you can see it here. But apparently, I’m not so good with indoor plants…I think I overwatered and killed them. Oops! I bought faux boxwood spheres from Hobby Lobby to transition to spring. Adding greenery to the planters brings in some life…even if it’s fake. 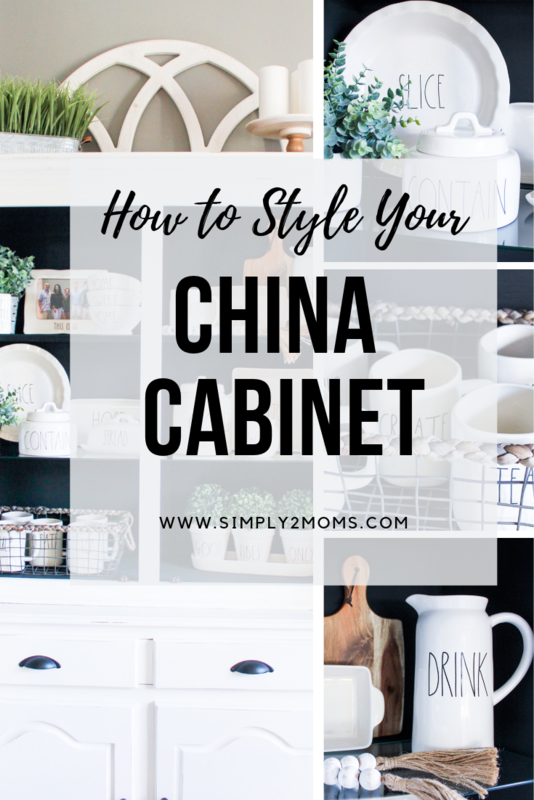 I tried to fit a mug tree inside the china cabinet but I couldn’t find one that would work in the space. 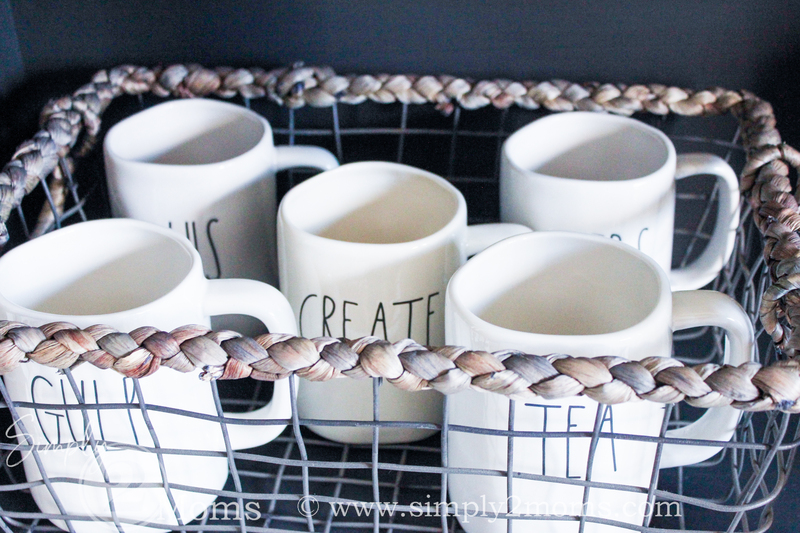 My sister suggested using a basket…it was the perfect compromise…I think I like it even more than I would like a mug rack. 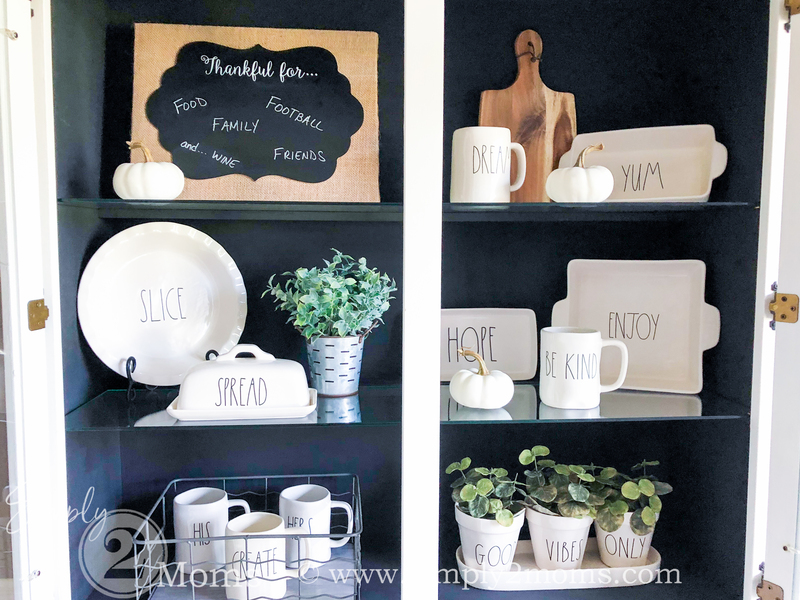 The wire basket definitely helps with the farmhouse style I was going for. My sister was able to score that cookie canister for me…yay! 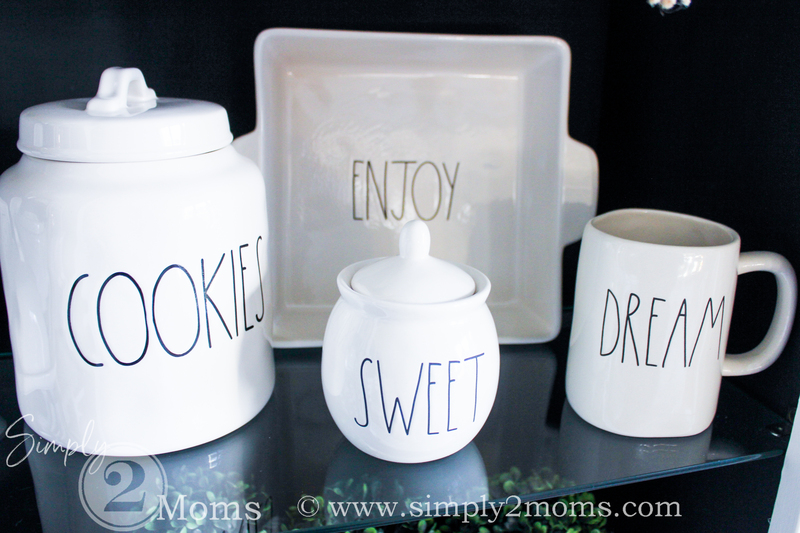 And I’m on the hunt for a creamer to go with that sugar bowl. So let me know if you see one. Adding another fake plant to the middle shelf brightens up the space. 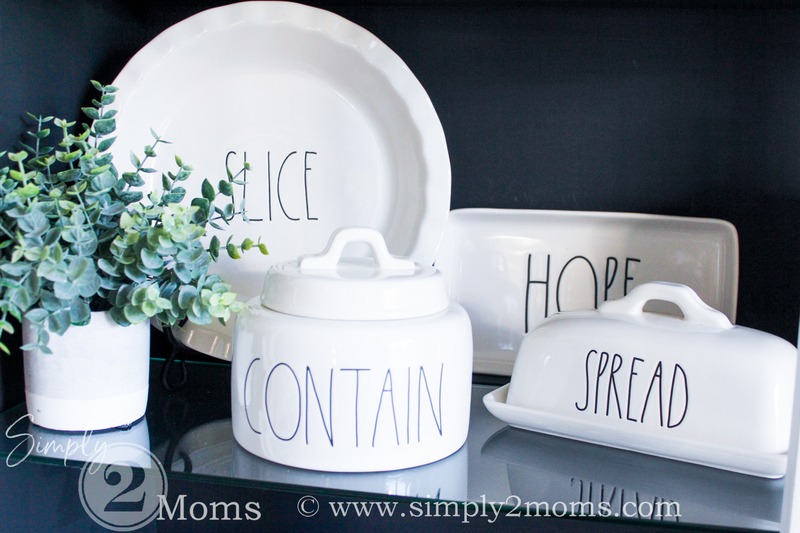 The “contain” canister was a lucky find a few weeks ago in our local HomeGoods. I walked up to the area where all the Rae Dunn is sold and there was a woman loading her cart with the 5th of 6 canisters. Asking nicely if she was going to buy all 6 of them…she let me take the last one. Whoo-hoo! I like how the top shelf is styled the best of the three. I just love the bowls my sister gave me because she no longer wanted them in her china cabinet. And my favorite quote sits next to a picture of my family. 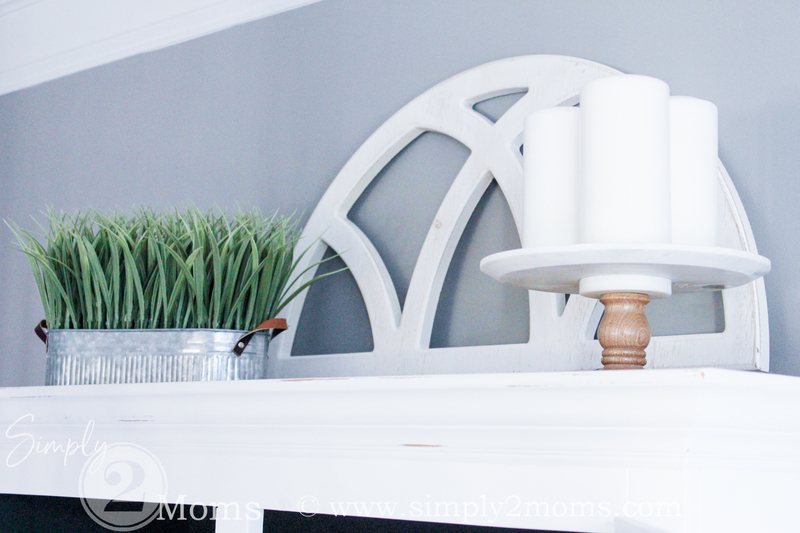 Adding wood with the beads & cutting board warm up this shelf. Love the jute tassels on the white wood beads! Maybe I need to add a few more of these wood beads to the china cabinet and even in other areas of my home. I had some out during the holidays but packed them away…I think I should pull them back out of storage…don’t you? 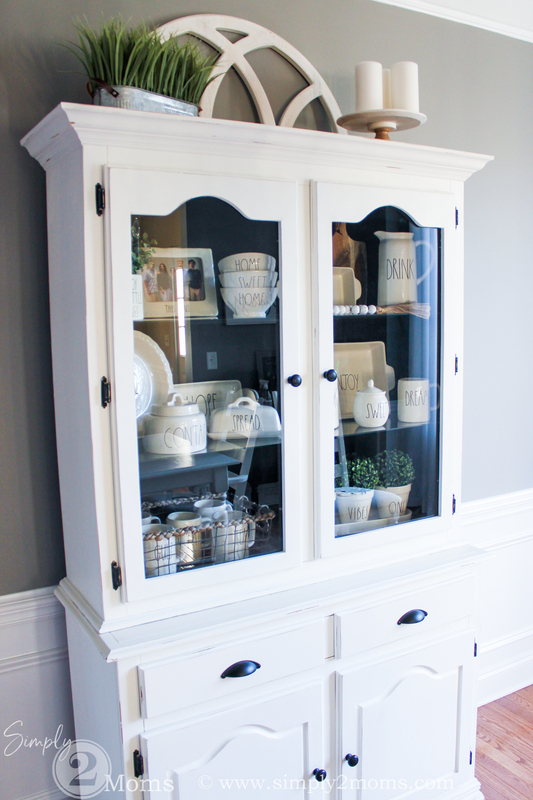 The last area to complete in my dining room china cabinet makeover was the top. 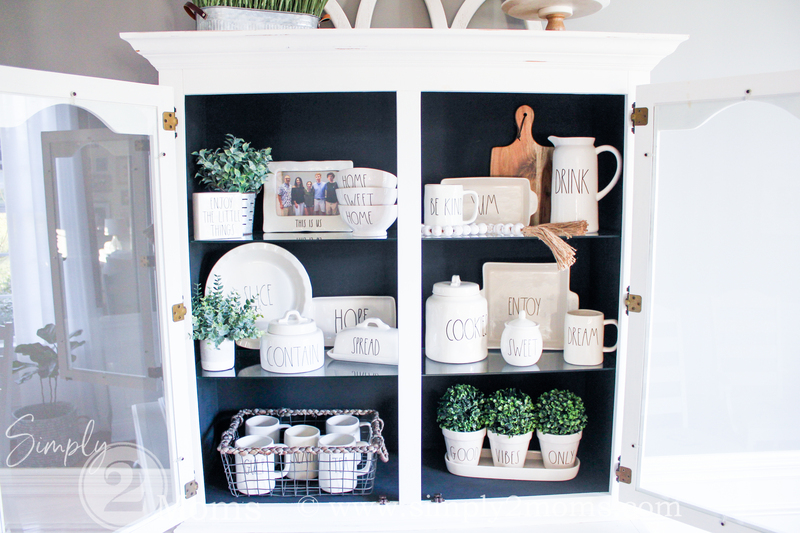 The inside of the china cabinet has been done for a month and I wanted to share it with you, but I couldn’t do that until I figured out what I wanted on the top. 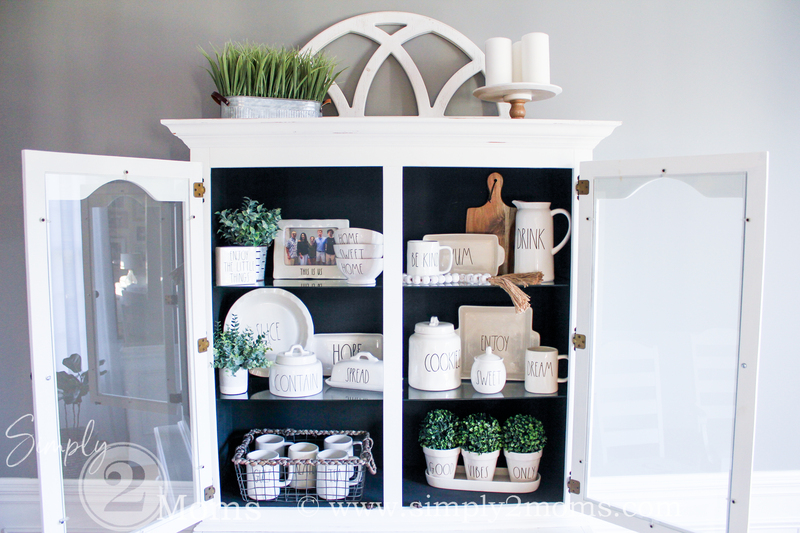 I’m embarrassed to admit how many items I bought last week to style the top of the hutch. I wasn’t loving most of what I bought so I shopped my house and I found the greenery in the galvanized tub (very farmhouse-y) in a closet. The wood and marble cake stand with candles was also tucked away not being used. 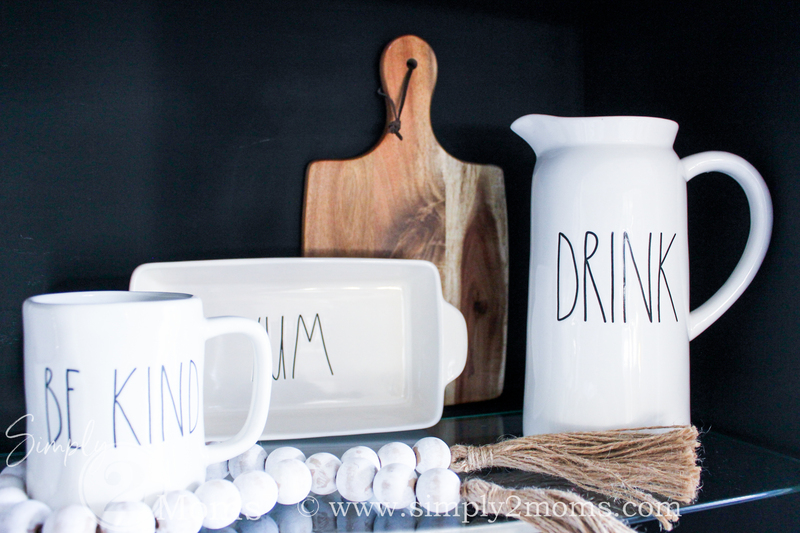 The only new piece I used was the white wood wall decor…and it was only $17 from Hobby Lobby. Yay…now I have more money to buy Rae Dunn! 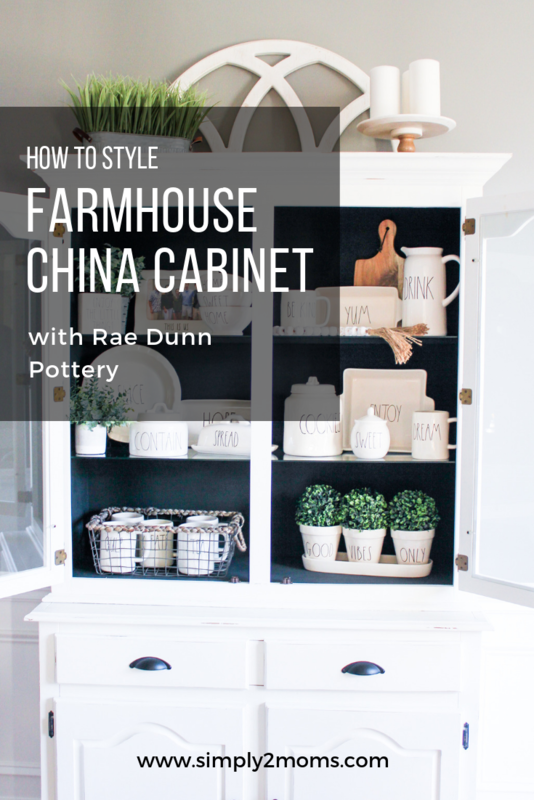 And that’s how I styled my farmhouse china cabinet with Rae Dunn pottery!